Berean Bible Fellowship seeks to promote fellowship among those who believe the truths contained in the Doctrinal Statement and to proclaim the gospel of the grace of God in this land and throughout the world. Recognizing the one true Bible Church in this dispensation, composed of all who possess genuine faith in Christ (Ephesians 1:22,23; 2:8,9), it is not the purpose of BBF to form a denomination or church organization, or to carry out the function of such in governing or directing groups of believers. 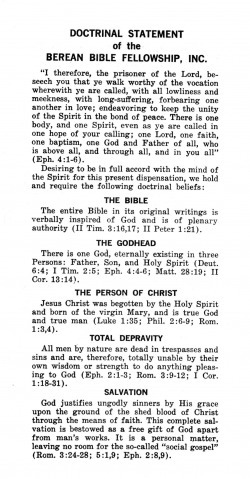 DOCTRINAL STATEMENT of the BEREAN BIBLE FELLOWSHIP, INC.
“I therefore, the prisoner of the Lord, beseech you that ye walk worthy of the vocation wherewith ye are called, with all lowliness and meekness, with longsuffering, forbearing one another in love; endeavouring to keep the unity of the Spirit in the bond of peace. There is one body, and one Spirit, even as ye are called in one hope of your calling; one Lord, one faith, one baptism, one God and Father of all, who is above all, and through all, and in you all” (Eph. 4:1-6). There is one God, eternally existing in three Persons: Father, Son, and Holy Spirit (Deut. 6:4; I Tim. 2:5; Eph. 4:4-6; Matt. 28:19; II Cor. 13:14). Jesus Christ was begotten by the Holy Spirit and born of the virgin Mary, and is true God and true man (Luke 1:35; Phil. 2:6-9; Rom. 1:3,4). All men by nature are dead in trespasses and sins and are, therefore, totally unable by their own wisdom or strength to do anything pleasing to God (Eph. 2:1-3; Rom. 3:9-12; I Cor. 1:18-31). God justifies ungodly sinners by His grace upon the ground of the shed blood of Christ through the means of faith. This complete salvation is bestowed as a free gift of God apart from man’s works. It is a personal matter, leaving no room for the so-called “social gospel” (Rom. 3:24-28; 5:1,9; Eph. 2:8,9). All the saved are eternally secure in Christ (Col. 3:1-4; Phil. 1:6; Rom. 8:1; 8:29-34; 8:38,39; John 10:27-29; Eph. 1:13,14). The Holy Spirit is a Person, Who convicts the world of sin and Who regenerates, baptizes, indwells, enlightens, and empowers believers (John 16:8; Titus 3:5; I Cor. 12:13; Eph. 1:13,17,18; 3:16). In the present dispensation there is only one true Church, which is called the Body of Christ (I Cor. 12:13; Eph. 1:22,23; 3:1-6) separate and distinct from the prophesied, earthly kingdom of Christ. The historical manifestation of the Body of Christ began with the Apostle Paul before he wrote his first epistle (I Thes. 2:14-16 cf. Acts 13:45,46; Phil. 1:5,6 cf. Acts 16; I Cor. 12:13,27 cf. Acts 18). The gifts necessary for the ministry of the Body of Christ are those enumerated in Ephesians 4:7-16. Of these, only the gifts of evangelists and pastors-teachers are in operation today. All the sign gifts of the Acts period, such as tongues, prophesy and healing (I Cor. 12:1-31), being temporary in character, have ceased (I Cor. 13:8-11). By reason of Christ’s victory over sin and of His indwelling Spirit, all of the saved may and should experience deliverance from the power of sin by obedience to Romans 6:11; but we deny that man’s nature of sin is ever eradicated during this life (Rom. 6:6-14; Gal. 5:16-25; Rom. 8:37; II Cor. 2:14; 10:2-5). As saints (Lit., “set-apart ones”) and members of the true Church (Lit., “called-out ones”) we are to maintain a Christ-honoring testimony, separate from all forms of worldliness and apostasy, demonstrating obedience to the Lord Jesus Christ and love to all men (Rom. 12:1,2,9; II Cor. 6:14-18; Eph. 5:11; I Tim. 6:20,21; I John 4:19). All saved persons have been made members of the Body of Christ by one divine baptism (I Cor. 12:13). By this one baptism every member of the Body of Christ is identified with Christ in His death, burial, and resurrection. In the light of the statement concerning the one baptism in Ephesians 4:5, the statements concerning baptism in Colossians 2:12 and Romans 6:3,4, and Paul’s statement in I Corinthians 1:17 that “Christ sent me not to baptize, but to preach the gospel,” we affirm that water baptism has no place in God’s spiritual program for the Body of Christ in this day of grace. There is no place in Scripture where the Lord’s Supper and water baptism are linked together either as ordinances or as sacraments for the Church. The rapture of the Church “which is His body,” and the second coming of Christ will be pre-millennial. He will come first to receive the members of His body to Himself (I Thes. 4:13-18; Phil. 3:20,21), and later to receive His millennial kingdom, over which He will reign (Zech. 14:4,9; Acts 1:10,11; Rev. 19:11-16; 20:4-6). Because of the distinctive nature of the Body of Christ, the resurrection and rapture of the Church, which is His body, will take place before the great tribulation (Jer. 30:7; Matt. 24:15-31) at His appearing in the air (I Thes. 4:13-18; Phil. 3:20,21; Titus 2:13,14; I Cor. 15:51-53). The resurrection of the other saved dead will occur after the tribulation (Rev. 20:4-6). Nowhere does Scripture extend the hope of salvation to the unsaved dead but instead reveals that they will ever continue to exist in a state of conscious suffering (Luke 16:23-28; Rev. 14:11; 20:14,15; Col. 3:6; Rom. 1:21-32; John 3:36; Phil. 3:19; II Thes. 1:9). The teachings of universalism, of probation after death, of annihilation of the unsaved dead, and of the unconscious state of the dead, saved or unsaved (Luke 16:23-28; Phil. 1:23; II Cor. 5:6-8), are opposed by us as being thoroughly unscriptural and dangerous doctrines. The mission and commission of the Church which is His Body is to proclaim the message of reconciliation (II Cor. 5:14-21) and to preach Jesus Christ according to the revelation of the mystery (Rom. 16:25; Eph. 3:8,9) with all boldness. In this we should follow the Apostle Paul (I Cor. 4:16; 11:1; Phil. 3:17; 4:9; I Tim. 1:11-16). That distinctive message which the Apostle of the Gentiles (Rom. 11:13; 15:16) calls “my gospel” (Rom. 2:16; 16:25) is also called “the gospel of the grace of God” (Acts 20:24). We, like Paul, must preach the entire Word of God in the light of this gospel (II Tim. 4:2; Gal. 1:8,9), and strive to reach those in the regions beyond where Christ is not yet named (Rom. 15:20; II Cor. 10:16). For those in agreement with our Doctrinal Statement who would like to become a member of the Berean Bible Fellowship, please visit the BBF Membership page for details.